The event combines local beer, local food and caring Houstonians to craft Valentines and raise money for those who have served the country. The evening includes a bake sale that features sweet and savory items from some of Houston's best pastry chefs and home bakers. There will be plenty of goodies to enjoy with beer at the event and to take home for later. The planning committee is seeking donations of baked goods that pair well with beer. To sign up to bake, visit the website or email valentinesforsoldiers@gmail.com. Craft tables will be set up so that you can get creative and make valentines to send to veterans. Donations of craft supplies are encouraged. H Town StrEATS and Fraiche Mobile Kitchen food trucks will be onsite ready to feed hungry guests. 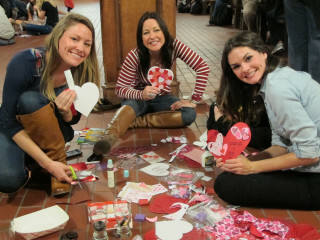 The event began as a simple idea: To create Valentines for soldiers to show appreciation for their service. Valentines for Soldiers started in 2010, when friends gathered to make valentines and care packages for deployed soldiers. Food blogger Nishta Mehra, known as the Blue Jean Gourmet, organized the event. She has since rallied food truck owners, professional bakers, food writers and photographers to this cause each year. Valentines created at the event will go to Houston VA Hospital as well as veterans groups around the country. The public can submit the address of a veteran to receive a Valentine via a form on the website. Proceeds will benefit two Houston-area organizations, Team Red, White & Blue and Expedition Balance. Both groups provide support and community for Houston-area veterans as they make the difficult transition to civilian life.